Piston-to-wall clearance is a crucial measurement for any engine, and different applications can require wildly different specs. We explain the science of why. Among the shiny objects that emerge from a new box of high-performance pistons, you are also presented with a spec sheet detailing the piston’s critical dimensions and, among other things, the all-important piston-to-cylinder wall clearance. It’s the core specification that engine builders always target to ensure trouble-free operation of the engines they build. Piston-to-wall clearance is set near the bottom of the skirt on the thrust side as shown here. Between the clearance point and the ring pack, no part of the piston comes close to contacting the cylinder wall. It is universally understood that proper clearance is essential to successful operation, and that too much or too little can easily lead to fatal engine damage. Some small clearance is essential to provide room for the lubricating medium, but most clearance is built in to accommodate component expansion rates as an engine come up to operating temperature. Your new set of Wiseco pistons will give you top performance if you follow the instructions that come in every box. The recommended piston-to-wall clearance ensures proper fit and trouble-free operation. Most end users regard the recommended piston-to-wall clearance as an all-inclusive indicator of the piston’s optimum fitment in the cylinder bore for safe operation. In the overall sense they are correct, and careful attention to the recommended fit will almost always ward off the dreaded evils of excessive friction, piston slap, ring damage, and attending failures. The recommended measurement point on the piston is the largest diameter point on the piston, thus it must be fitted with the proper manufacturer’s clearance. Think of it as the safety point manufacturers provide to prevent improper fitment and subsequent engine damage. But there is more to it. When the engine is running at operating temperature, every point on the piston skirt and the ring land area has a specified clearance designed to ensure proper function of the piston and associated ring pack. The piston skirt is the point of contact on the thrust sides of the piston. Clearance is measured here at the manufacturer’s recommended point, which varies between pistons. It is the piston’s largest diameter and the point of critical clearance. In determining the optimum piston-to-wall clearance, designers consider the entire physical and thermal operating environment of the piston by evaluating the following factors and how they inter-relate for each piston design. Different applications present varying requirements. Engine speed, cylinder pressure, skirt loading, rod angularity and other factors all play a role in the designer’s assessment of a piston’s final clearance requirement. 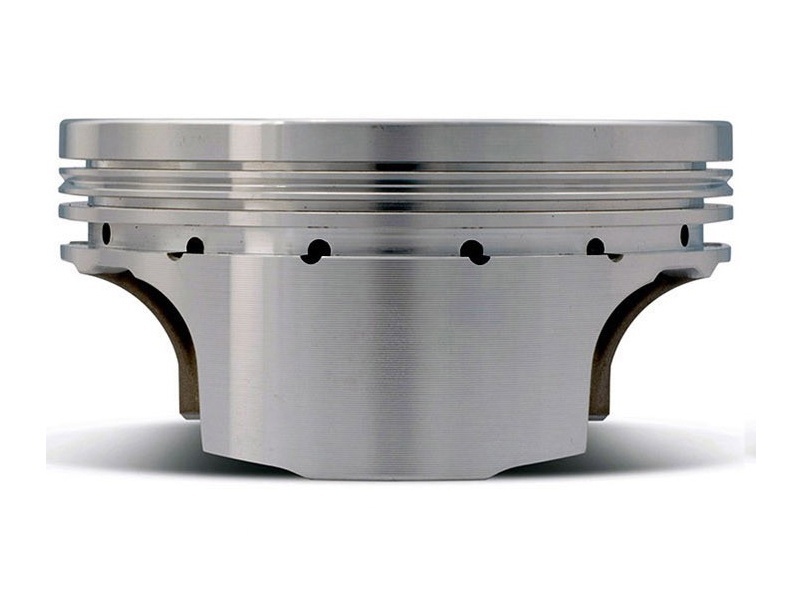 Many low-speed production engines still use inexpensive cast pistons with very controlled expansion characteristics. They can be fitted very tightly in the bore and last a long time under normal service. They don’t rattle on startup, which is a major concern to automakers, and they provide smooth, trouble-free operation year after year. Piston-to-wall clearance is a critical measurement that is influenced by a multitude of factors. Knowing piston size, base material, engine style, and many more details are critical to getting it right. Continuous operation at WOT dramatically increases the thermal loading of the piston, causing it to expand more. Engines subjected to sustained WOT almost always require additional clearance to allow for increased expansion, and to ensure adequate space for the lubricating oil film splashing on the cylinder walls. Racing engines and marine engines that endure sustained WOT operation are prime examples of the need for increased clearance. High-performance street engines running nitrous oxide injection require more piston-to-wall clearance than say, your average four barrel equipped daily driver. Other considerations include highly boosted engines and those incorporating nitrous oxide injection. 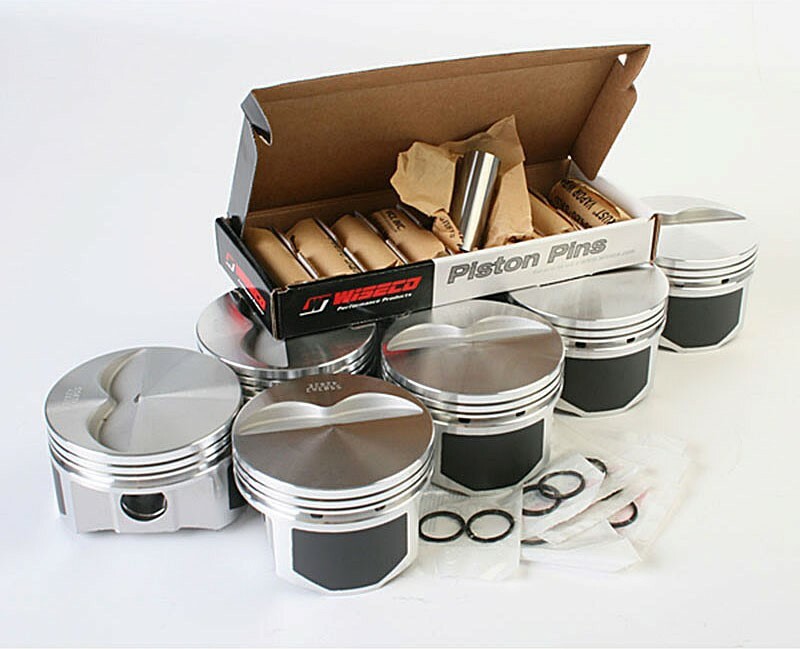 Recommended clearances are specific to the application and piston designers take this into consideration when helping you with a set of custom pistons. Highly loaded engines like these tend to experience greater heat loads and much higher cylinder pressures that can increase piston deflection and require more clearance. While the piston and rod are the mechanism by which force is transferred to the crankshaft, the piston is also tasked with maintaining a stable platform to support the rings. An unstable piston diminishes ring seal and thus power. 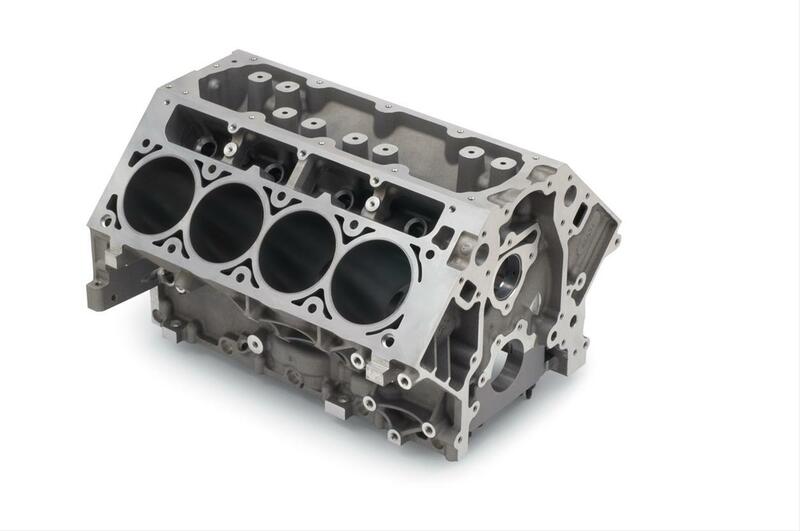 Block type makes a huge difference in piston-to-wall clearance requirements. 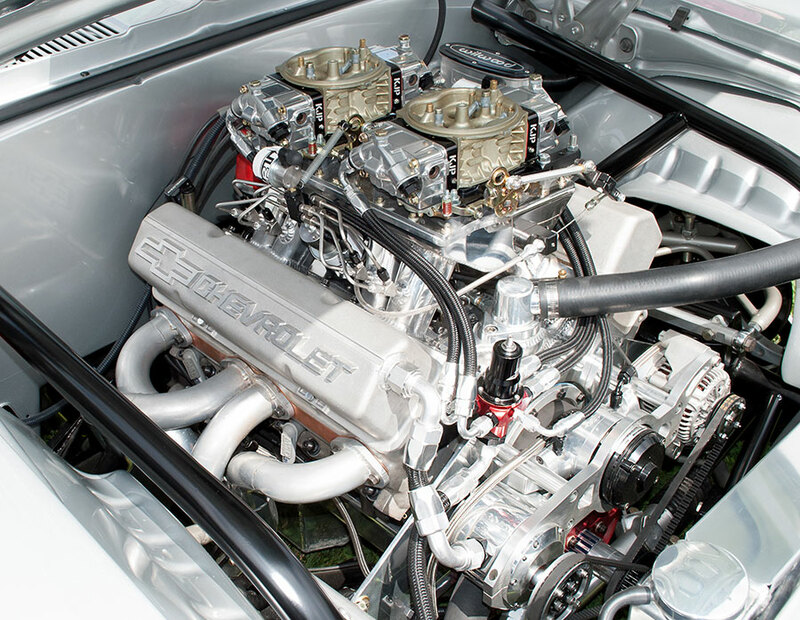 An aluminum block, such as this Chevrolet LS3 block, will expand more than a cast-iron block changing clearance requirements significantly. Cast iron and aluminum are the predominant materials from which cylinder casings are manufactured. These materials exert considerable influence on piston-to-wall clearance, primarily due to their thermal expansion characteristics. Cast iron blocks expand less than aluminum blocks with cast iron cylinder liners and are thus more thermally stable. Some blocks incorporate Nikasil-plated aluminum cylinders without liners––these expand even more. In every case, dimensional changes due to heating must be addressed to arrive at a proper piston clearance. And that includes accounting for the thermal characteristics of the piston material as well. Bore distortion due to cylinder head fastener clamping load also influences final piston clearance figures. Depending on the engine and the construction of the block, it is also possible for other fasteners to distort the bore. These might include motor mounts, pumps, bracketry and so on. The base material of the piston is probably the biggest determinate of piston-to-wall-requirements. Pistons made from 2618 material will need slightly larger clearances than those made of 4032 material, which contains thermally stabilizing silicone. Cast pistons with an integral expansion strut were commonplace for many years and they still provide very reliable service in low-power, low-rpm situations. 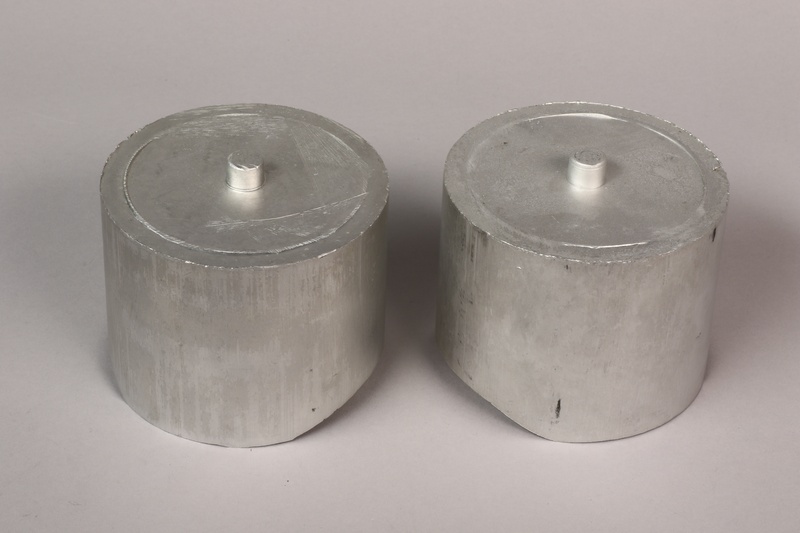 Close to a century ago, the addition of 12 percent silicon as an alloying constituent was found to significantly stabilize the expansion of aluminum components, such as pistons. 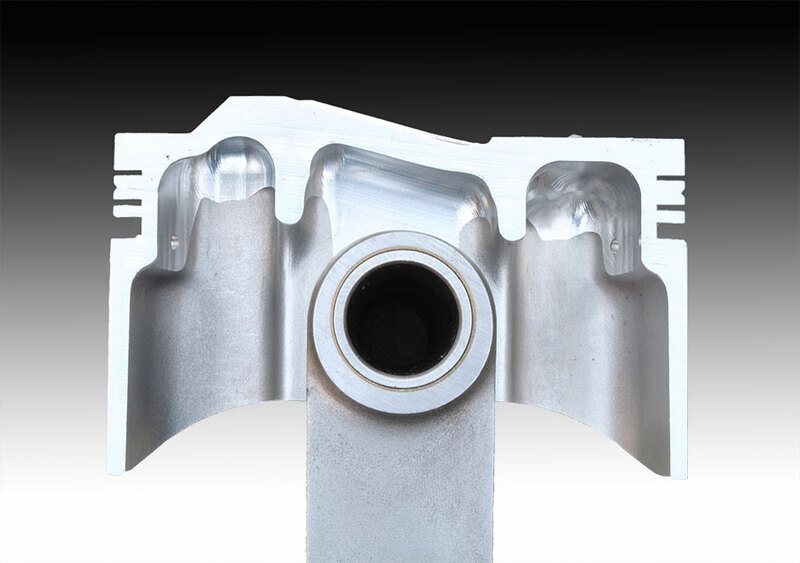 Known as eutectic-aluminum-silicon alloy, it permitted the development of cast, high-silicon pistons with up to 20 percent silicon alloy. These are known as hypereutectic pistons and their chief advantage is a very low expansion rate. They can be installed with as little as 0.0005-inch piston-to-wall clearance on the major diameter. Interestingly, when a modern forged piston with more initial cold clearance reaches operating temperature, the difference in running clearance is less than might be surmised. For example, Wiseco uses 2618 and 4032 alloys for all its forgings. While the expansion rates are different for each alloy, Wiseco has made pistons from each alloy for the same engine operate successfully at nearly the same running clearance. The higher-expanding 2618 piston may have a larger initial clearance than a 4032 piston, but once the engine reaches operating temperature, both pistons will have similar running clearances. The piston’s barrel shape places the point of critical contact low on the skirt to provide a stabilizing point near the bottom of the piston. Pistons are also oval, not round, to reduce friction on non-thrust surfaces. 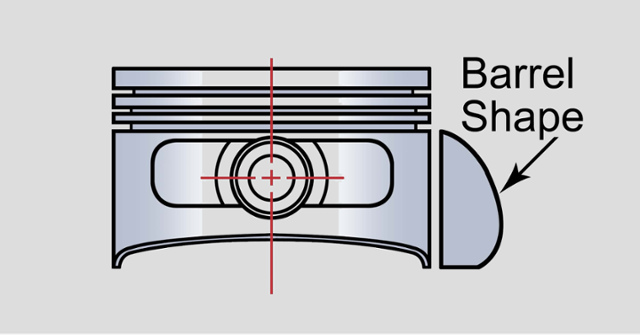 The piston profile plays an important role in determining clearance. Tighter clearances tend to reduce piston slap (clatter) on cold startup and they provide a more stable fit to promote good ring seal. Pistons with full radius skirts (as opposed to barrel shaped profiles) are claimed to be capable of a tighter fit. The reality is such that the full skirt piston, because it has a full radius profile, is measured at the very bottom and has a much greater clearance everywhere but at the measuring point. This is an example of the overall clearance of the piston differing significantly from the published clearance specification. The bigger the piston, the more it will expand. 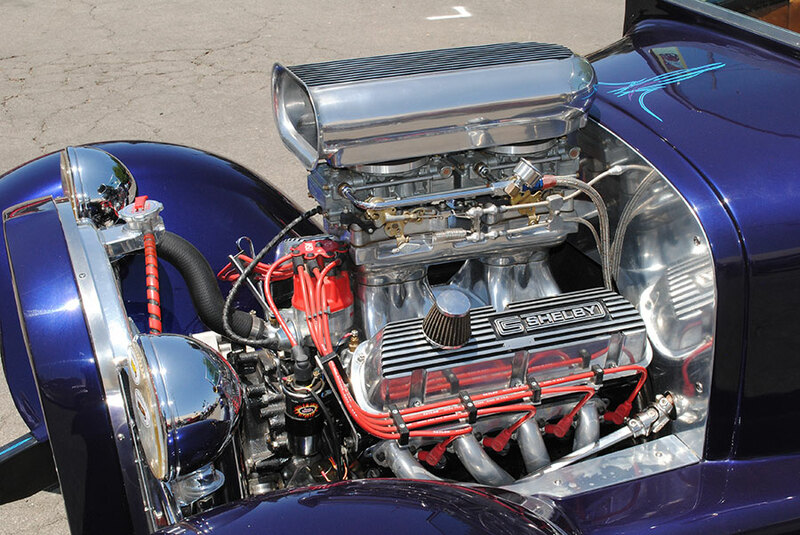 Hot Rods and American V8s tend to use large pistons which require more initial piston-to-wall clearance than say, a Honda engine with its smaller bore size. Larger pistons typically require more clearance than smaller pistons. A comparison of extremes illustrates the point if we consider the difference in two unrelated pistons used for flying. The thimble sized piston from a Cox .049 model airplane engine operates just fine with such minimal clearance that it does not even require any form of piston ring to seal the combustion gas. Conversely, a 5.400" diameter piston from the Merlin V-12 engine that powered the P-51 WWII fighter requires .012" to .014" clearance for satisfactory operation. Here, we also note that the thermal loading from friction is far greater in the Merlin engine than in the Cox engine. Under the extreme conditions of airplane racing, massive heat loading occurs in the Merlin engine with the pistons expanding accordingly. 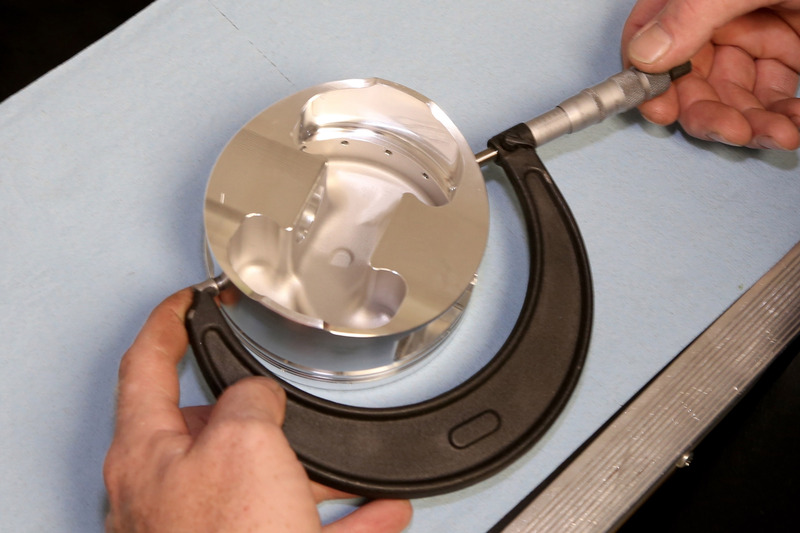 Setting piston-to-wall clearance is often a function of the honing process. 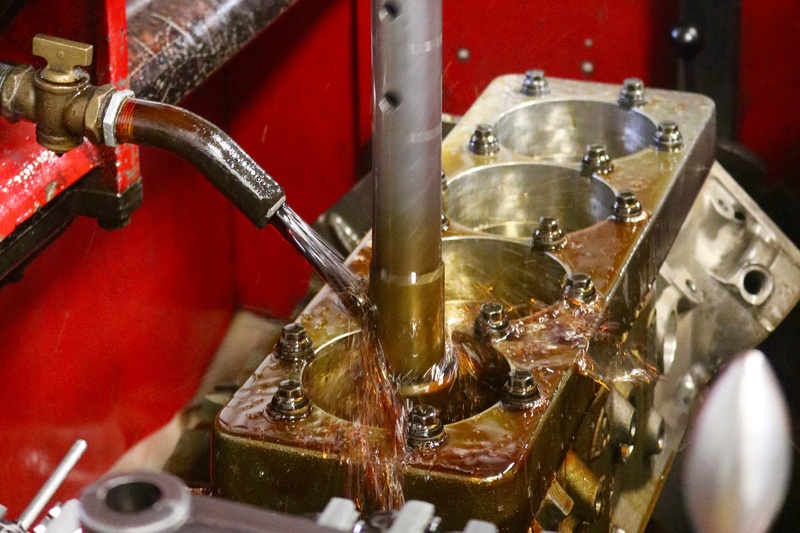 Most machine shops will not hone a block until they have pistons and spec sheet in-hand. The honing stones remove material very slowly and also condition the cylinder walls to be both smooth, and have the necessary valleys to make oil stick to them. Oil on the cylinder wall adapts to local conditions at operating temperature, but the piston clearance must allow some room for the lubricant film to do its job. The oil film is supplied by splash coming off the rapidly rotating crankshaft. In simplified terms, oil bleeding out of the rod and main bearing side clearances is flung onto the cylinder walls and controlled in a thin film by the oil ring. The oil film can be less than 0.001-inch and is accounted for in the final piston clearance. An oil film must be present to not only lubricate the surfaces, but to transfer heat from the piston to the cylinder block and then the cooling system. The cooling style of an engine affects piston-to-wall clearace. 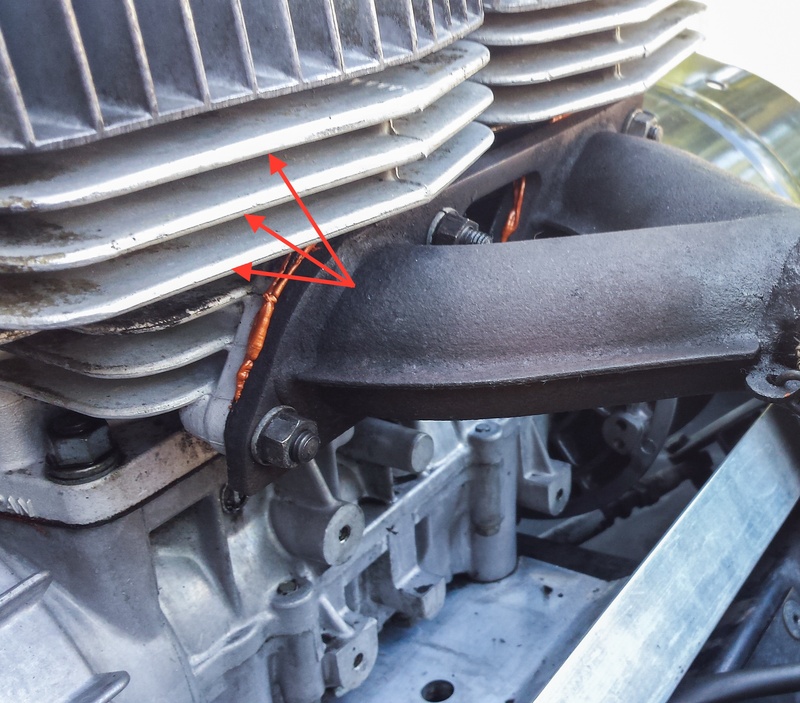 Because air-cooled engines are at the mercy of ambient air temperature and flow over the engine's cooling fins (shown), they see a wider variety of operating temperatures and need additional clearance. Considerable difference exists in clearance requirements for air cooled engines versus liquid cooling. Air cooled applications such as found in Volkswagen or Porsche cars, are essentially non-regulated systems at the mercy of air flow conditions. They are more prone to bore distortion and uneven expansion. Air cooling is more finicky due to broad fluctuations in air flow. In an aircraft engine for example, cooling also diminishes with altitude because the air is thinner and carries away less heat. Liquid cooling provides greater consistency with an easily regulated system and quicker warm up as a bonus. The cooling medium is transferred in and out as required by thermal conditions and regulation provided by the thermostat. These factors affect the resultant piston-to-cylinder bore clearance. 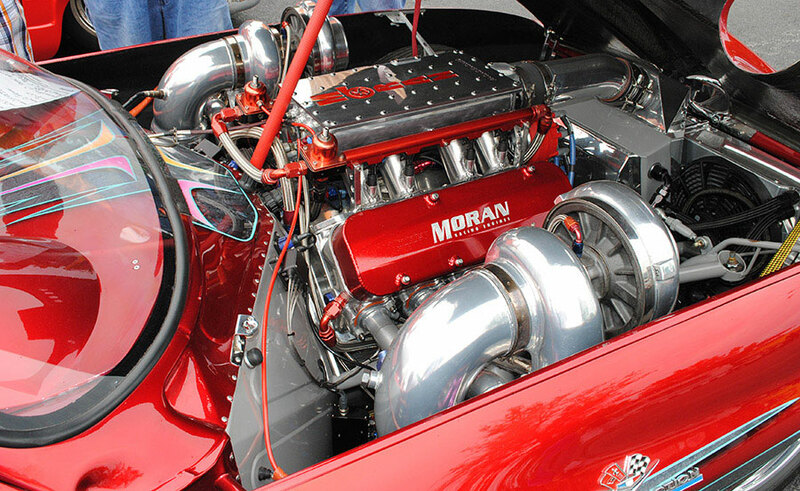 Ultra-high horsepower engines with power adders, such as turbos, superchargers and nitrous, require more clearance to deal with the extreme heat generated under WOT conditions. Engineers go to great lengths to determine proper piston to wall clearance. This includes real world testing on running engines with various skirt configurations and different clearances to determine the suitability of each piston for a particular application. When a design is finalized, the clearance and checking location are specified in the instructional paperwork that accompanies the pistons. If these recommendations are strictly followed you can expect trouble free operation from your new pistons and optimum cylinder sealing for maximum power.